The Usual Suspects. BONGRANDE has garnered quite a reputation for being the foremost source for antique & vintage metal furniture. These Norman Bel Geddes steel dressers have original brushed metal pulls on their wooden tracked drawers. BONGRANDE's skilled metal artisan awaits your command. 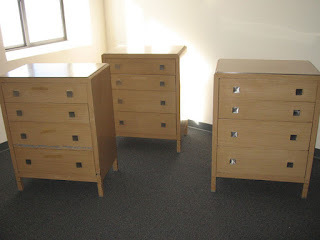 Email BONGRANDE@yahoo.com to order your stripped metal dresser.